Surge and I talked about his scholly/Not status when he joined the team last year and I believe we were in agreement that he was not on Schollarship. Cobra were you able to get the A-Day poster? Nah, I didn't get to go. I was having to do as much around my house as I could. I wanted it to be purty in case a tornado came thru I just knew that it would be too wet Sunday to do anything. Zenitz says he was in scholarship. Let the debating begin...again. This will go down as one of the Great University of Alabama mysteries. Zenitz says he was in scholarship. I figure Zenitz has more inside connections than most of the guys that post on here. I hope he lights it up at Arky State. Surely he has more than me... I was limited to just trying to work the numbers and If I was wrong with his status, I credited someone else with a scholly they dont have. But, no one may ever really know who is or isnt for sure when it gets to the fringe guys. I will acquiesce to he who "should" know more than I would ever know. Slade Bolden looks like a player. Running game will def need to get better. OLine outclassed by the D.
Bulovas should worry about Reichart(knocks PAT right down the middle). Shavers catching in a crowd would be nice to have a BIG WR that could be useful. TE's catching the ball, dont seem to have that on the line TE though. I'm not just saying this because I think his uncle is a good guy, but I honestly believe that Slade will eventually be a leader for us. The kid has tons of talent. Saw the game last night and Tua looked bored most of the game. I did not watch any of the 4th quarter though. Solid observations. I came out of spring feeling better about our special teams (Reichart and DeLong both looked really good--and we have elite returners in Waddle and Diggs.) I feel MUCH better about our defense. DL looked dominant, and it looked like McMillon and Lee are both capable guys next to Moses. And the secondary looks better than it has in years. This defense feels like the old Alabama defenses to me. The only downside is I came out of spring feeling less optimistic about our offense. I know we had some OL out, but that unit has a long way to go. 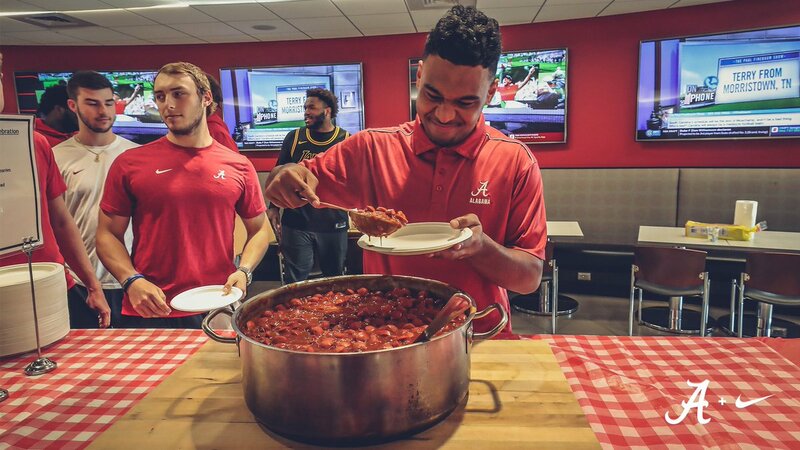 Tua was "meh" which isn't really what I wanted to see after his UGA and Clemson performances. Run game was weak, tons of dropped passes. The whole offense just seemed out of sink. Overall, I feel better about this team--I just hope our OL gets healthy and gels and Tua can take the next step as a QB. If those two things happen, this team could bring home a natty. The whole offense just seemed out of sink. Remember, there's no scheming against the opposition in a scrimmage. The Offense is running super vanilla stuff that's totally random in its ability to work versus whatever defense. I wouldn't read into it too much. I've learned to take my cues from Saban regarding what to be concerned about. He didn't like the dropped balls, and he wanted more efficiency in the run game. But he never once indicated concern about Tua or the offense as a whole.